Outdoor water features can add an entirely different charm to your home. The presence of water creates a serene ambience that you can enjoy and relax in. An increasing number of people now like to spend more time in the outdoor spaces of their property; and most of them want to have a more natural, earthy landscape in their backyards. They want a place that would help them let go of the stress. Water features can be a great way to achieve that. At Timberrock Enterprises LLC, we’ve realized the effect flowing water has on its surroundings. We encourage our clients here in Easton, as well as the surrounding towns of Bethlehem, Allentown, Stewartsville, and Nazareth to go for a more natural look and feel in their backyards. Most of our clients in Whitehall, Hackettstown, Morristown, Flemington, Califon, High Bridge, Hampton, Asbury, and Stroudsburg, PA prefer to have an organic outdoor space. They choose garden water features that look like they're a part of the landscape. We also service Washington, Clinton, Old Wick, Califon, High Bridge, Hampton, Asbury, Stewartsville, and Tewksbury in NJ. Sometimes fountains and fixtures stand out like a sore thumb amongst the natural greenery of your landscape. They disrupt the flow and beauty of the garden or lawn. Today, there are some water features that have become popular; they create a small oasis for you to enjoy, away from the concrete jungle. Waterfalls – The sound of moving water is very soothing and has been used for thousands of years to add a calm, serene environment to gardens. Now, homeowners are moving away from fountains and artificial looking fixtures to rock waterfalls. These create an earthier environment, giving your home a relaxing atmosphere. You won’t need to travel to remote locations to get away from civilization, you can simply lounge in your mini-oasis and unwind in the comfort of your home. Streams – It doesn’t take too much time or effort to add streams to the landscaping and they’re a great outdoor water feature for smaller backyards. They don’t take up much space and still provide the benefit of flowing water. You can add a small stream that leads to a little pond at the corner of you property without investing too much. Streams, like waterfalls, add a rustic, natural feel to your backyard. Ponds – The Japanese have used small ponds to enhance the look of their homes for ages. 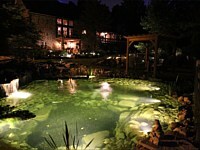 Many people are opting for natural ponds instead of large, elaborate fixtures for their landscape. Some people even add koi fish in them. 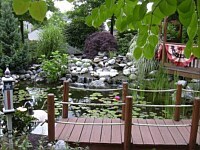 You can easily create an entire mini-ecosystem by adding waterfalls, streams and ponds to your backyard. You will have a space that feels far removed from the hustle and bustle of the city. If planned properly, it can be a retreat that you can escape to without even leaving your property. At Timberrock Enterprises LLC we always encourage our clients to try different ways to add an element of nature to their landscaping. 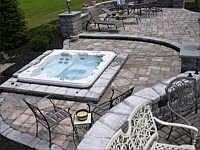 If you have any questions and queries about backyard water features, you can certainly contact us. Just give us a call at 484-764-7175. You can also get in touch with us by filling in the contact us form. We’ll get back to you as soon as possible.